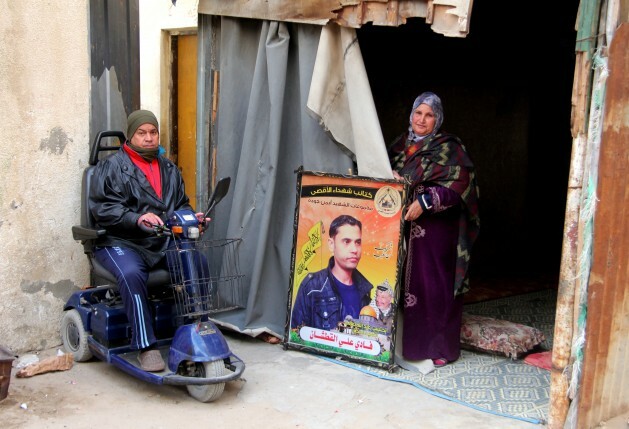 The mother and father of Fadi Al-Qutshan beside their son's framed picture outside their home in Gaza. Credit: Khaled Alashqar/IPS. GAZA CITY , Mar 28 2014 (IPS) - “If you want to live and receive medical treatment, you have my number, so you can call me and agree to my request. You will then get medical help, and survive.” The request, the patient said, was from an Israeli intelligence officer looking to recruit him in exchange for treatment. The 28-year-old Fadi Al-Qutshan never did become a spy for Israel. And he did not survive long. The centre has documented several cases of arrest and manipulation of patients from Gaza needing to pass through the Erez crossing. Qutshan suffered from a rare illness that led to artery blockage. With no help possible in Gaza, he was advised to go for treatment at a hospital in the West Bank. His application to Israeli authorities – needed for a Palestinian to enter another Palestinian area – was refused several times. It was finally granted on the intervention of the Palestinian Centre of Human Rights in Gaza. At the West Bank hospital Qutshan was told he needed treatment at the Israeli hospital, Tel Ha Shomar. He did get passage and admission to the Israeli hospital and was operated on successfully. He needed a follow-up visit to complete treatment. That return became conditional. “His phone rang when he was sitting next to me, and his expressions started to change and he suddenly ended the call and switched off his phone,” his mother Zeina Al-Qutshan told IPS. “He told me after that the caller was an officer from the Israeli intelligence services offering a permit to return to the hospital in exchange for working with Israel as a spy in Gaza.” Zeina said her son refused to collaborate. He died soon after. The centre has documented several cases of arrest and manipulation of patients from Gaza needing to pass through the Erez crossing (at the intersection of Gaza, the West Bank and Israel), and of harassment of their family members or others accompanying them. The number of patients arrested and put in Israeli jails has increased, according to the Palestinian Ministry of Prisoners. The total number of Palestinian political prisoners and detainees in Israel is 4,800, and it says about a quarter require medical help. More than 1.5 million people live in Gaza Strip on a small area of 360 sq km. As a result of the Israeli-imposed blockade, Gaza is suffering from severe shortage of hospitals and medical equipment. Hospitals in Gaza are unable to deal with all medical needs, and they refer critical cases to the West Bank and Israel depending on permits from the Israeli army who control the Erez crossing point. The health system in the West Bank is in a better situation but it is Israeli hospitals that are well-equipped. Physicians for Human Rights (PHR Israel) has condemned Israeli policies towards Palestinian patients seeking medical access. “Physicians for Human Rights-Israel had called in the past on the Israeli security authorities to stop this manipulation of the most basic humanitarian needs of medical patients from Gaza as a means of coercing them and their families,” the organisation told IPS in a statement. Over the last three years, 13,000 cases have been referred for further and urgent medical treatment to Israeli and Palestinian hospitals outside Gaza, according to the Ministry of Health. The Israeli blockade of Gaza, coupled now with closure of the Rafah crossing with Egypt, means that this number is likely to increase over the coming weeks and months.